Need Seekers – who try to read customers by interacting with them using tools like e.g. prototypes or Big Data with the aim of better understanding their behaviour in order to be first to market with novel products and services. One of the key results is, that companies applying the Need Seeker paradigm outperform both other groups financially by a clear margin, setting themselves apart by more than 14% from the average. Technology Drivers in comparison come out last of the three cohorts, falling short more than 6% against the average percentage of companies that outperform their peers. We all know the drill: The Business side has identified a strategic direction – but R&D and the Innovation department are following their own internal compass. The above mentioned Booz & Co studies clearly highlight the benefits of aligning Business and Innovation strategies closely. According to the authors of the 2014 issue, enterprises ensuring strategy alignment post 40% higher Operating Income growth over a three-year period while increasing Shareholder Returns by an average of 100%. Starting as early as with Edison, many successful innovators have believed in the increased effectiveness of functionally diverse innovation teams. A statistical study using data from 142 projects in 95 companies published earlier this year in the “IEEE Transactions of Engineering Management” seems to finally lend some statistical support to this view. According to the author, F. Blindenbach-Driessen, in particular companies that are strongly organised by function seem to benefit from such teams, reaching revenue and profit targets earlier, fulfilling customer requirements better, or gaining some other competitive edge. Innovations are always late. This seems to hold true even more, ever since almost all innovations appear to include some type of software component. However, Harvard professor Stefan Thomke and his collaborators showed as early as 1998 that time-to-market can be improved by 55% by employing agile software development methods. This finding is overwhelmingly supported by a 2014 survey by software consultancy VersionOne where 73% of the project managers surveyed report measurable reductions in development time by applying Agile. On top they claimed improved ability to handle changing priorities as well as other benefits for their projects. 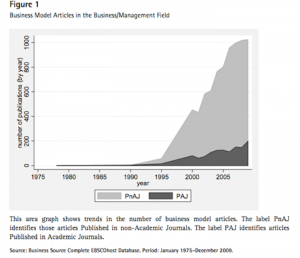 Since the advent of the internet, the importance of business models for innovation success has increased dramatically (see illustration below). Larry Keely and his team at Doblin Consulting have researched business model components of more than 3000 innovations. As publicised in their 2013 book “10 Types of Innovation”, they found that “average innovators” use approximately 1,8 innovation types in their business models whereas “successful innovators” employed 3,6 innovation types – a number that, according to the authors, seems to continue to increase. Overall there’s nothing in these numbers we would not have expected from our experience with improving innovation processes. But in our experience it makes arguing changes and improvements a lot easier when they are supported by some stats and figures.